Summer has started and I am already seeing kambu koozh stalls in the streets. In the street stalls, kambu koozh is usually stored in large mud pots which are natural coolants. 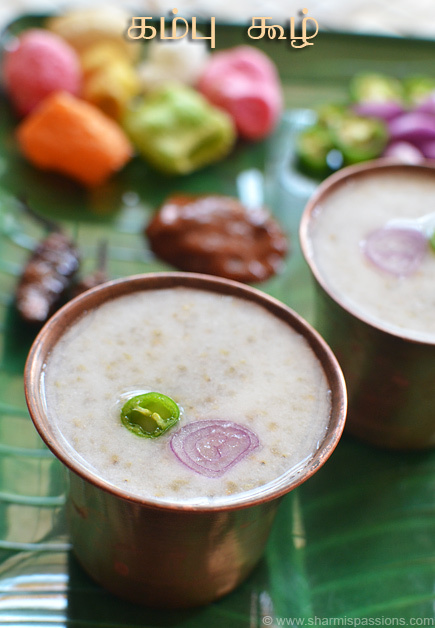 Certain foods are best consumed in summer to cool the body and keep it refreshng and this kambu koozh is one among them. I bought and stored kambu some 4months back.I had few kambu/bajra/pearl millet) recipes in mind but somehow cooking with the millet kept delaying that the pack was kept untouched.Finally a day came or I should say the vazha ilai plate motivated me and I made kambu koozh last month and clicked it….and after that its been regular for breakfast and we just love it…its so refreshing! 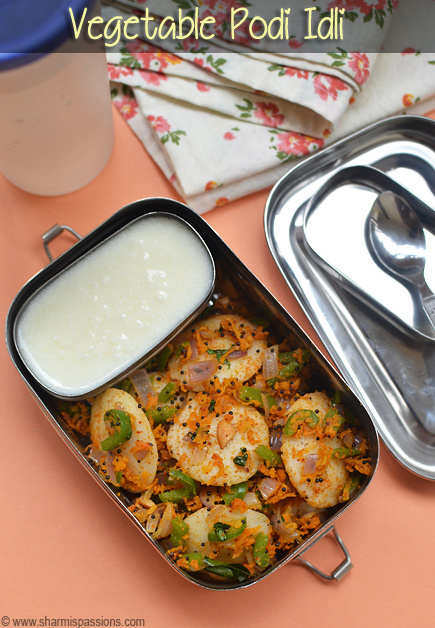 When hubby said that most of all the sidedishes were the same in the street shops too as the ones I have presented for clicking, I was overjoyed….yay!! so I have done justice right?!!! Check for neeragaram which I posted last summer. The traditional way of cooking kambu is to cook it in thick bottomed vessel but we need to baby sit for it and also its very time consuming…now who has the time and energy to do that?! 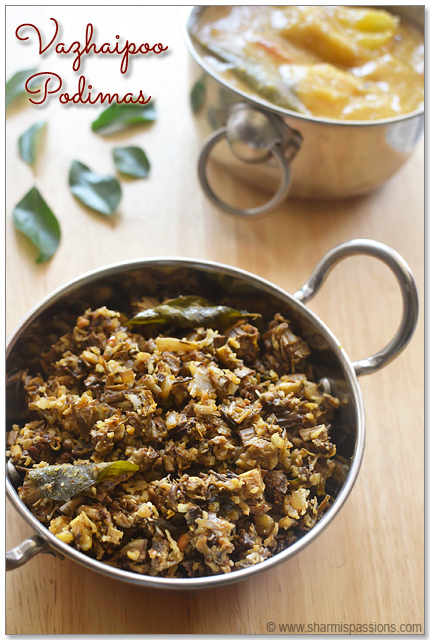 atleast that is not for me…So I took the shortcut of cooking kambu in pressure cooker as my neighbor suggested. 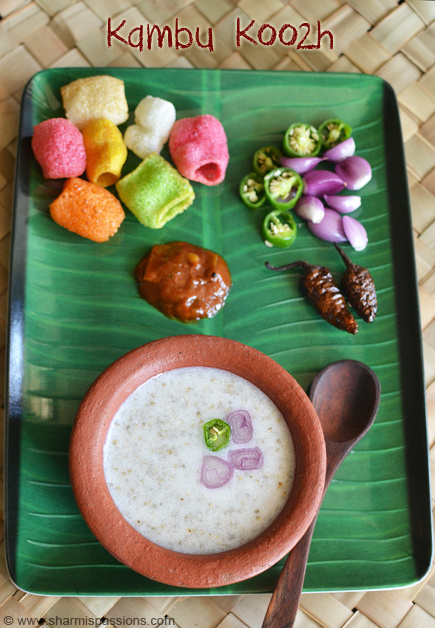 I love it with milaga vathal and hubby loves it with raw onion.Though I don’t make all the sidedishes shown in the pic, I wanted to show the accompainments for kambu koozh so clicked with all these and ofcourse enjoyed them too :). 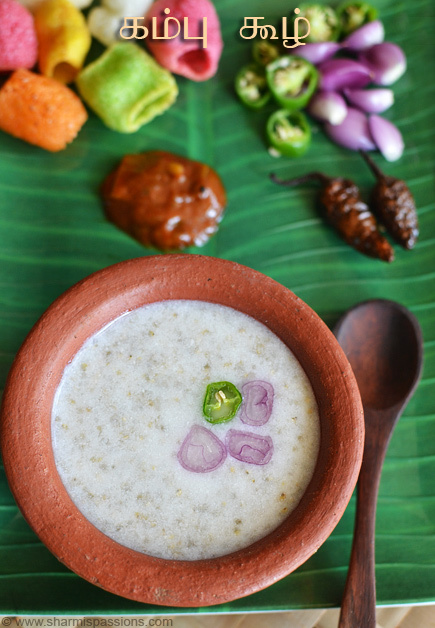 Kambu is rich is fiber and makes a complete meal…so you can make the spread for lunch skipping rice.Kambu is believed to generate heat so the buttermilk compensates for it making it the best body coolant for summer. I used broken kambu so used it as such.Rinse the kambu well and transfer to pressure cooker and add water and pressure cook in low medium flame for 3-4 whistles. Once pressure releases, open and switch on the flame.Keep stirring till it becomes thick enough to roll into a ball.Let it cool down for few mins, then roll them into balls as shown. Place the kambu balls in a bowl containing water till immersing level.Let it rest for an hr(you can leave it overnight in the fridge too), you can refrigerate it.Then mix it well.I used my whisk for this. Mix well without any lumps, then finally add buttermilk,required salt and give a quick stir. 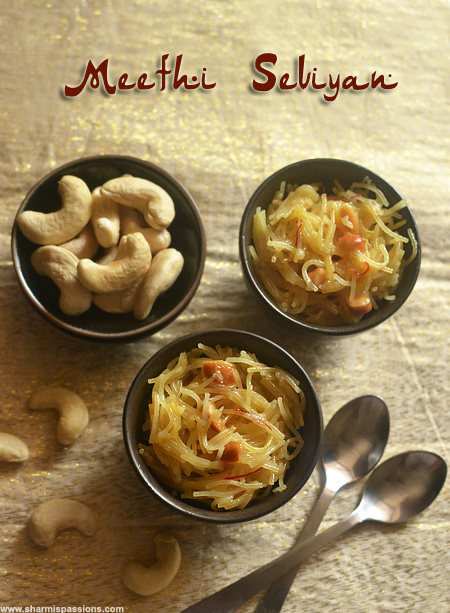 Serve with raw onion or vadams or pickle of your choice. 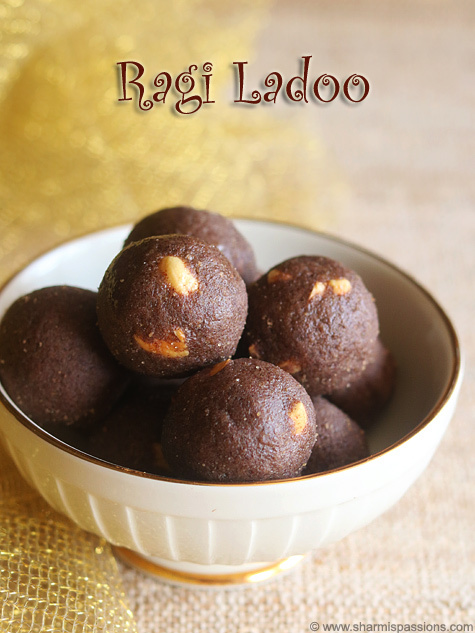 Sowmya told that we can make the cooked kambu balls and refrigerate it the previous night itself. 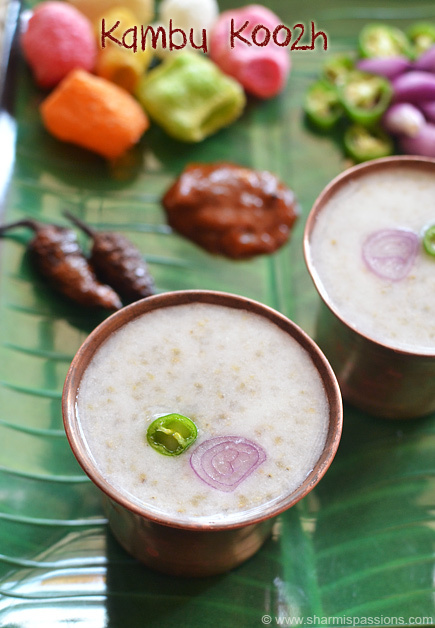 And morning you can just mix it with buttermilk and serve it.She makes it that way and tells it works good too.I think that the traditional way too which lets the millet to ferment and it gives a slight tangy taste too. I am not sure whether broken bajra is available at all stores, you can pulse it in mixer. I got it from Nilgiris..Actually I took the whole kambu pack when the sales pati enlightened me saying that broken bajra is easy to cook so got this. I have seen readymade bajra powders too, but I recommend getting the millet. 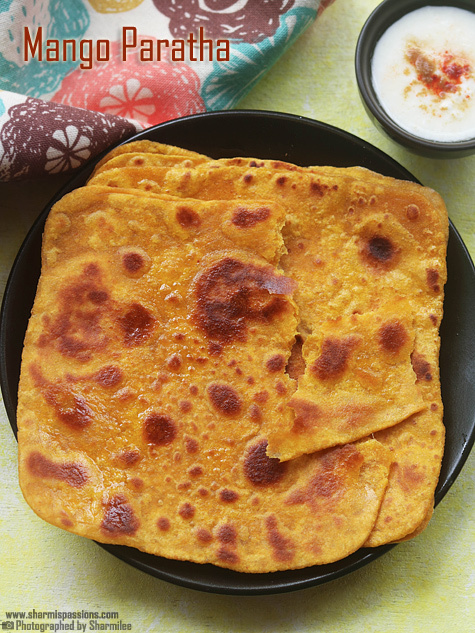 You can use chilled buttermilk too. It usually gets thick after cooling down so switch off accordingly. You can even cook kambu in a thick bottomed vessel,Keep stirring occasionally, when the rice is cooked all the water will be absorbed and switch off when it is thick enough to hold as a ball. but it takes time so I usually use the pressure cooker method. Make the drink littly runny so that its drinkable. But if you like it as porridge then make it spoon-able. Kambu sadam is just to stop with step 2. I will be making a separate post for it in future. Previous Post: « Celebrating 5yrs of Sharmis Passions! I too cook kambu using pressure cooker now a days.Sauteed onion and chilli is the best ever combo for this. love your picture. Such a cooling and comfort drink for summer..never got a chance to taste it. omg sharmi im really drooling…… makes me remember my place …….. really tempting photos. the tumbler is also very apt!! cool yaar!!! Healthy and delicious looking millet. Lovely presentation. omg! 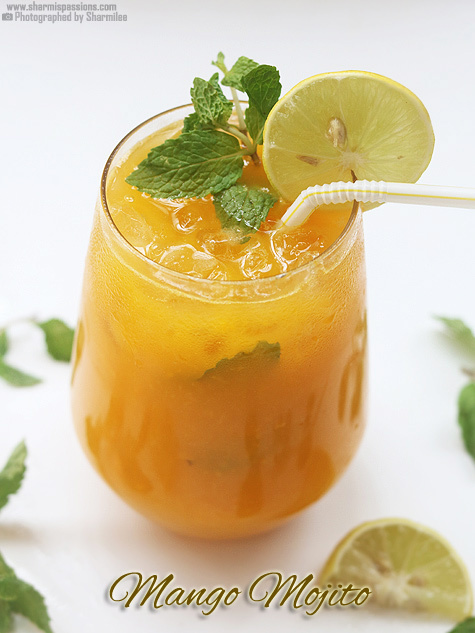 this looks so refreshing and perfect for summer. Wat a food, nutritious and a nostalgic post definitely. i haven't cook that so far.. but i had that kambu twice just this week, the way they prepared was very good and i believe that is healthier too… if possible i will also make my own.. thank you for given the way of making. I have a question. 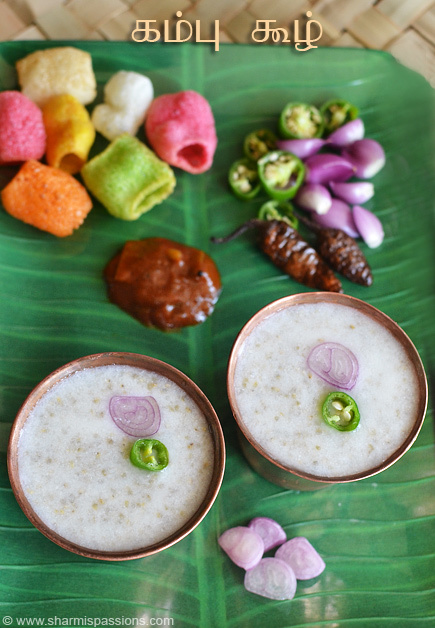 We should use only Pearl Millet for making this koozh? I can't use thinai, kuthurai vaali or Saamai for making this Koozh? Please let me know. Yes you can make porridge using thinai,kuthirai vali but the method is different will post a version soon. I have kambu koozh ready made powder can i directly mix it with buttermilk and have them? Dry roast the flour for few mins until nice aroma comes , then make it like a koozh(check my ragi koozh post) then add buttermilk. Vry interested I'm going to trying…I have one doubt before cooking we want to soak the kambu r not??? Probably I am the only one going to try this, so if I cook 1 cup of bajra and it makes 5 to 6 balls, how long can I keep this in the refrigerator? Can I eat/drink the porridge for breakfast 5 to 6 days? Or do I have to make it everyday? I have raw whole kambu. Should I roast and split in mixie and then do this?? Or don’t need to roast?